Courses longer than 10 days in length or occuring over several weeks for the theory behind the techniques, includes work based practical conservation and landscape management. This is the page to have alook at to find details of a degree in countryside management or arboriculture HND etc. A 12 week residential nature conservation traineeship at Lower Sharpham Farm in the picturesque River Dart Valley, South Devon. Ideal for final year/recent undergraduates, Masters students or anyone interested in nature conservation. It is a unique experience and provides the foundation skills required for your future. Free accredited training in ABC Level 2 practical Environmental and Conservation skills. Modules Include: Practical Skills for Woodland Areas, Hedgerows and Footpaths. Ideal for those looking to develop countryside management or conservation skills, whilst assisting the HLF restoration of the Historic Parkland at the National Botanic Garden of Wales. Develop Practical Countryside/ Horticulture Skills with the Land Team at Groundwork Trust, Oldham and Rochdale. Accredited Level 1, Practical Countryside Skills Certificate and Diploma places available. 15 week course duration, open to 19-24 year olds only. This inspiring programme offers comprehensive biodiversity training to ‘up and coming’ scientists enabling them to build their own knowledge, and also help to address the global shortage of skills in this area. Throughout the course you will develop knowledge in all aspects of the countryside: conservation, wildlife, recreation, access and visitor management. You will gain experience in rural settings by having the real countryside on your doorstep. Degrees are awarded by the University of Glasgow. This course builds on environmental and landscape knowledge from previous studies to provide the necessary policy and business expertise required of future countryside managers. 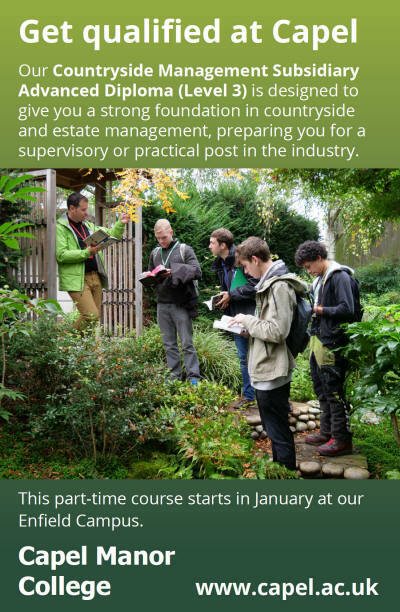 It is specifically designed to equip you with the knowledge and expertise to gain employment within the conservation or countryside management sectors. As well as gaining an understanding of scientific principles you will be able to develop practical skills in laboratory work, modern information technologies, geographical information science and fieldwork. Your degree will allow further study of specialisms such as ecology, hydrology, geology and soil science. This course has been developed with input from employers and organisations who are involved in conserving and managing biodiversity, and in response to the demand for managers who are fully trained in industry standard techniques of research and fieldwork in wildlife and countryside management. Learn habitat management, wildlife survey and land management skills in the beautiful Yorkshire Dales. Validated by York St John University previous graduates have gained employment with a range of employers including Natural England and the National Trust. This course provides a strong foundation in countryside and estate management, preparing you for a supervisory or practical post in the industry. Part-time, two evenings per week at Enfield campus. Based at the Birmingham Botanical Gardens we offer both the Level 2 and Level 3 City and Guilds Diploma in Countryside and Environment. They are both full time practical courses working with our partner Wildlife Trusts. The courses include modules in woodland, wetland and heathland soil and plant science. This course has been developed in response to the increasing demand for employees within the environmental, conservation and heritage sectors. A unique blend of academic and practical training is offered to ensure that you will be fully prepared to enter into immediate employment or to progress onto a Top-up Degree. The countryside and coastal environments in the UK are under increasing threat and their management requires professionals with the right mix of practical and intellectual skills. The Foundation Degree in Countryside and Coastal Conservation provides the interdisciplinary skills that the countryside professionals of the future need to effectively manage these complex environments. If you’re a new graduate or an industry professional wanting to broaden and deepen your knowledge in a wide range of areas in health, safety and environmental management, then this master’s course is for you. Throughout the course you will develop an understanding of Scotland's landscape & how it is managed. You will have an opportunity to study a wide range of subjects including biodiversity conservation, classification & identification of organisms, conservation skills & countryside recreation access. Successful completion of the HNC allows you to progress to HND. Available at Aberdeen, Ayr, Elmwood, Oatridge. Learn the basic skills, knowledge & understanding of working in agriculture & the countryside & prepare for employment or progression to a more advanced course, employment or an apprenticeship. The programme offers a broad range of subjects and practical skills whilst allowing students to develop at their own pace. This one year course will introduce & develop skills in welding, fabrication & blacksmithing & give a good introduction to the world of working with metals. Covers City & Guilds Performing Engineering Operations (PEO) Level 1 or 2 & the NPTC Level 2 Certificate in Forgework. A follow on course to the Level 1, this one year course will further develop skills in welding & fabrication & blacksmithing. You will study for a City & Guilds Performing Engineering Operations (PEO) Level 2 qualification and a City & Guilds Level 2 Certificate in Engineering. This two year advanced course gives students the opportunity to learn about and build on the essentials of working within the wildlife and countryside industries, including estate skills, population surveys, freshwater and wetland management, woodland habitat management, ecological concept and application, safe use of equipment and machinery, archaeology and landscape history. This course covers a range of countryside skills. You will also look at conservation, wildlife and habitat management. This qualification gives you the opportunity to study a range of specialist technical practical skills & knowledge that build upon the core skills required to for working in the countryside such as estate maintenance skills, population surveys, safe use of equipment & machinery with further areas of study such as land use & recreation, & pest & predator control. Starting Sep-18 This course covers a range of countryside skills. You will also look at conservation, wildlife and habitat management. This course involves a wide range of practical and field based studies and visits to nature reserves and recreational sites run by Ranger Services and organisations such as RSPB and National Trust for Scotland. Our Elmwood and Oatridge campus offer this course. The Tame Valley Wetlands Landscape Partnership is offering Open College Network WMR Level 1 Award and Certificate in Environmental Conservation and Heritage. The training is FREE through the Heritage Lottery Fund. The course requires a commitment from the learner with regards to time that they can spend carrying out practical work and written elements. There are no limits on eligibility. We are looking to take people on in two cohorts – the first starting in May and the second starting in July. The sessions will run from 9:30am to 4:00pm on Wednesdays on nature reserves in the Tame Valley Wetlands, located between Birmingham and Tamworth (in North Warwickshire and south-east Staffordshire). The scheme is based at Hams Hall Environmental Studies Centre on Hams Hall Distribution Park just outside Coleshill. We will be able to offer pick-ups from Coleshill Parkway train station and local bus stops. We can pay fuel expenses (up to ten miles one way) and can refund public travel costs on production of a valid ticket. Other free training in a range of environmental and transferable skills is also available. The Tame Valley Wetlands Landscape Partnership is offering Open College Network WMR Level 2 Award and Certificate in Environmental Conservation and Heritage. The training is FREE through the Heritage Lottery Fund. The course requires a commitment from the learner with regards to time that they can spend carrying out practical work and written elements. There are no limits on eligibility. We are looking to take people on in two cohorts – the first starting in May and the second starting in July. The sessions will run from 9:30am to 4:00pm on Wednesdays on nature reserves in the Tame Valley Wetlands, located between Birmingham and Tamworth (in North Warwickshire and south-east Staffordshire). The scheme is based at Hams Hall Environmental Studies Centre on Hams Hall Distribution Park just outside Coleshill. We will be able to offer pick-ups from Coleshill Parkway train station and local bus stops. We can pay fuel expenses (up to ten miles one way) and can refund public travel costs on production of a valid ticket. Other free training in a range of environmental and transferable skills is also available. 2.5 days a week for 1 year. An exploration of practical, community-led sustainability with experienced, pioneering tutors. Includes Permaculture Design, Organic Horticulture, Green Building, Woodland Management, Green Energy, Group Dynamics, Community Engagement, Soil and Ecology, Creating Change. "So much more than a great course. More of a life-shift." Starting 3 September 2019.